As we all know, fat tire bicycles can take up a lot of showroom space. But, with Rudy Rack’s FatStack, you can fit 6 bikes in the amount of space needed for 3. 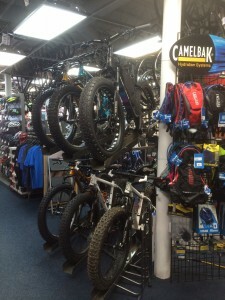 In just over 6 and a half feet, you can display six 4.0 – 5.0 fat bikes. And the second tier is at a reasonable height, allowing employees to take bikes on and off the rack. If these bikes are flying off your floor and you can’t keep them in stock, we have other display options available, as well as individual trays for purchase. Filter your search by Fatbike on our Shop Page to see what we can do!